To her great shock, Jesus knew immediately “that power had gone out from Him.” The woman thought she could be a nameless face in the crowd, an anonymous recipient of some life force that emanated from Jesus. Not at all! He wanted to meet the person who had such faith in Him. He wanted the crowd to know her, too. So, ignoring the ridicule of the apostles (“You see how the crowd is pressing upon You, and yet You ask, ‘Who touched me?’”), Jesus sought her out. She was terrified, fearing that her willingness to break the ritual law against contact with a woman like her would now be exposed. 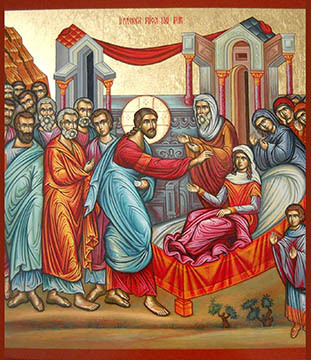 Nevertheless, instead of bolting from the scene, “she fell down before Jesus and told Him the whole truth.” The confession did not lead to condemnation. On the contrary, Jesus restored her, cured, to the covenant community. Calling her “daughter,” a term that referred to her covenant status as God’s beloved child, Jesus announced before everyone that her faith had now made her clean and given her the peace she surely had not known for twelve long years. Although physically not dead, this woman received true life from Jesus. She is an icon of all of us who, for whatever reason and for whatever length of time (twelve years or twelve hours), feel that we are the living dead. Our only hope is Jesus. To reach out and grasp at Him—a glance toward heaven, a loving touch of a crucifix, a request of prayer from a friend, the recitation of a Scripture verse—puts us in the same place of faith as this frightened woman. She teaches us that our best response to a deadening numbness that can overtake us is to fall down before Jesus (as Jairus did, too) and tell Him the whole truth. At that instant, our lives can be restored to us. Jesus wills it.